This guy is a bona fide FaReek. He loves to play music and plays a variety of styles. 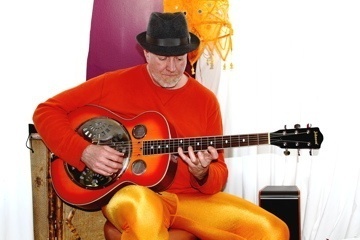 He plays mainly electric guitar oriented music like jazz/fusion, but has also been known to play Surf, Funk, Reggae, Ska, Celtic, Country and Contemporary Experimental music. It all started on his grandmother’s piano in Alamogordo, New Mexico, when he started picking out x-mas tunes and songs from albums that his parents played. Stuff like Henry Mancini, The Beatles, We Five, The 5th Dimension, and The Jackson 5. From that time to the present he has never stopped playing in bands and occasionally pushing the outside of the envelope. He likes cheese, chocolate and the color orange. Here’s where you can find Tom’s work.